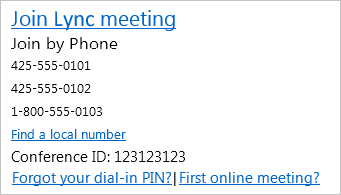 You can call in to a Lync Meeting if you don’t have a computer, or if you prefer to use a phone for audio. All you need is the conference number and meeting ID, which is in the meeting request. Dial the conference number listed in your meeting request. Tip: If you’re traveling, click Find a local number in the meeting request to find the numbers available for your current location. Enter the Conference ID using your phone dial pad. You may also need to enter a PIN and work number or extension. See below for more information. Depending on the meeting settings, you may have to wait to be admitted, or you may get connected automatically. When in the meeting, press *1 on your phone to get a list of the options you can use, such as mute, unmute, and so on. Do I need a PIN, work number or extension? Not always. Most of the time when you call into the meeting, you get connected directly and your phone number shows up in the participant list. You’re the leader (Organizer) of the meeting, and calling from a phone that is not connected to your account, such as a cell phone. You’re an attendee, but the meeting is secured and you need to be identified before joining, (referred to as Authenticated caller). Note: If you don’t remember your PIN, click Forgot your Dial-in PIN in the meeting request and follow the instructions on the page to reset.